The celebrity chef phenomenon. I don’t like it. In particular, Bobby Flay. Something about his voice and demeanor. But save that talk for another rainy day. Driving or walking by K Street, I’ve noticed, for a while now, “Bobby’s Burger Place”. Oh hell no, I thought. There it was, one the latest expansions of the vast culinary empire of America’s best-known celebrity chef. But every burger deserves a tasting, even if it means pitching in my share to Mr. Flay’s evil empire. Burgers are serious business and should not be swayed by personal opinions and emotions regarding their surrounding politics, values, situations, backgrounds, and even chefs. Skip the ambiance and interior (although the long, wavy snake-like “bar” was worth a glance), and get to the burger. I love avocados and anything made with avocados. Hence I ordered Bobby’s “L.A. Burger”, my eyes still voraciously staring down the other not-lucky-enough-to-be-chosen-today options. Everything with avocados seems to be called “California something” or “L.A. something”. 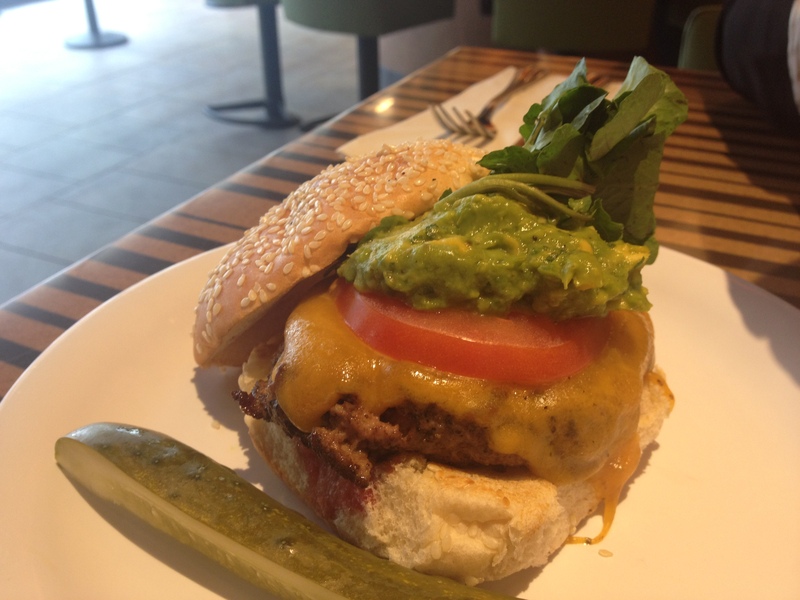 But guacamole and juicy beef patties go well with each other, so L.A. it is. The guacamole itself (or I think Bobby called it something else) was great. Rich and creamy, with just enough kick and lime juice. The patty was made with high-quality meat, and it was cooked right to a medium (warm pink center). But it could have used more fat. Bland, I would say. Burgers need a bit more fat dripping from them. Bobby had laid out his own “Burger Sauce”. Intrigued, I gave it two or three taste tests. I wasn’t as pleasantly surprised as I had hoped, as the sauce just seemed like a last second mixture of standard BBQ sauce and a few other jars in the corner of your pantry. As I walked out, I realized that I should have taken some shots of the sweet potato fries. Because above all, from Bobby’s Burger Place, Bobby’s sweet potato fries shined outright. I don’t know what kind of oil he fried them in, but Bobby’s fries were perfectly crispy on the outside, moist and vaporize-in-your-mouth silky inside. Bobby, good work on the fries. Love guacamole on a hamburger. Yum! The sweet potato fries sound crazy delicious.